At 18, no longer embarrassed by his mom. Remember when pizza day at school was a treat? It was usually Friday. And that was the only day Sam ever wanted to buy his lunch at school. No years of char-burgers and tater tots for him; no spaghetti and meatless-meat sauce, no limp iceberg lettuce salads, no breakfast-for-lunch, no Can-I-just-have-ice-cream- please? bargaining attempts. No school lunches for Sam, except pizza. And by the third grade, he had given up that, too. 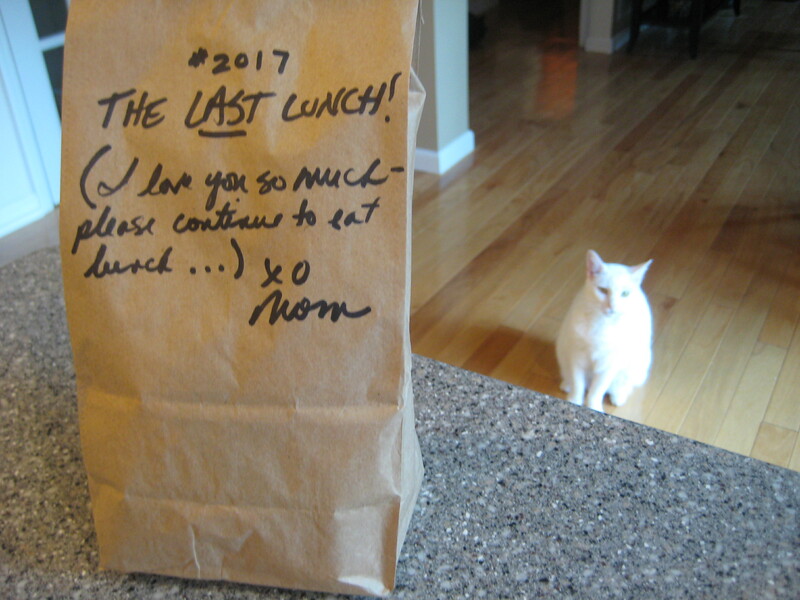 Today, I made brown-bag lunch #2017: My Last School Lunch for Sam. Two-thousand seventeen. That’s my estimate anyway, based on some creative but sound accounting. It may not be an exact figure, but I bet it’s pretty darn close. If anything, I bet it’s under the total. It sure feels like it’s under. All those bleary-eyed mornings of brown-bag duty feel like a lot more than 2017. In honor of this occasion, I am retiring several tired reusable plastic water bottles. For years, I would freeze and then carefully wrap a disposable bottle of water in foil and plastic wrap to include in Sam’s lunch bags. The ice would melt by lunch—luckily Sam never had one of those absurdly early lunch periods such as one year at his school (and I am not making this up) 9:40 a.m.—and it would keep the rest of his lunch cool. reusable plastic bottles filled with ice water. The last wasn’t a bad solution. He still managed to pitch them, forget them, and leave them a moldering in his locker; but on the whole, these worked. I am so happy to have made my last official school lunch. And that’s what Sam’s mom said. Congratulations on your last lunch! If you find yourself missing the process too much, come on over. I am just gearing up. ps – love the note. Don’t forget the whole-lot-o-love that was an added bonus every day. I remember how I dutifully did lunch bag duty for so many years. (Somehow I never found the inner strength to say, “No more. If you want a lunch then pack it yourself” as some of my friends did.) It wasn’t my favorite part of motherhood, but I really had a tug on the morning I did it for the last time. I love how you found a way to commemorate it! Nope, no “pack it yourself” moms in this family. And I wouldn’t have it any other way. Great post. Congratulations on this momentous Last Lunch Day. Second Acts are often sweeter, aren’t they? Must have something to do with perspective. I’ll tell you when my boy returns. If my boy returns? He’ll return – he needs the love and the food! Suzanne, LAST LUNCH? As you can imagine, I felt a bit of jealousy when reading this as I find myself reciting the contents of my refrigerator as I go to sleep, hoping a solid healthy meal with come together in the morning, or guarding the contents in the soup terrine, making sure there is enough for two lunches in the morning. I’ve finally resolved that this is my lot in life, I find creativity in the job and often am blessed with an empty Thermos after a lentil lunch. Anyway, seeing that it ends, makes me a little sad all the same. Love ya! but still grateful as all get-out. Looking for something? Try here.